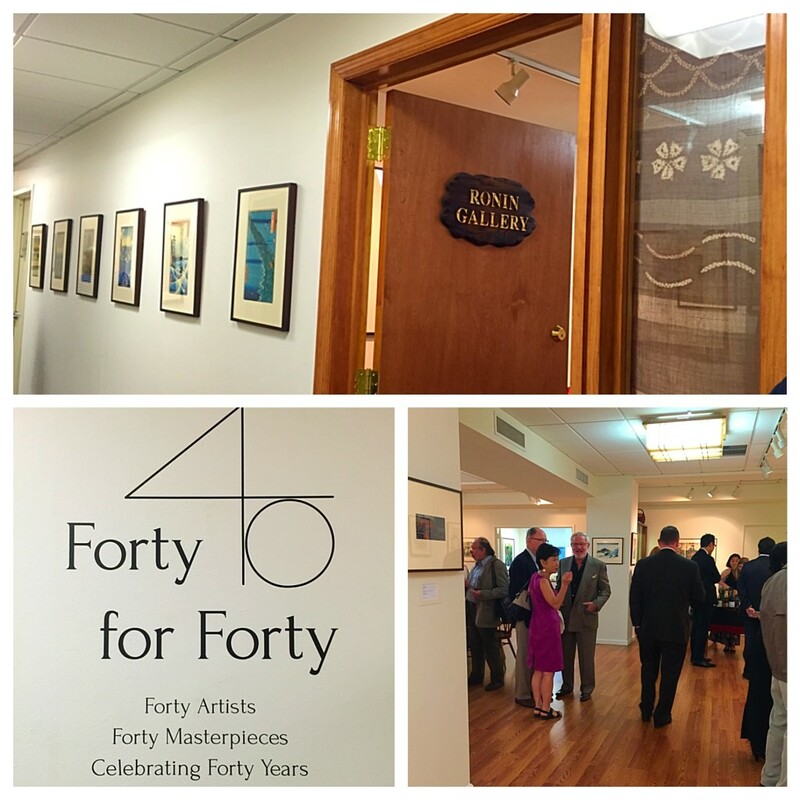 On Tuesday, September 15, The Ronin Gallery had a very special reception celebrating their 40th anniversary with an exhibition featuring 40 artists. The show consists of many artists’ works spanning throughout the ages of ukiyo-e. Such artists include Katsushika Hokusai, well-known as one of the top artists of the Edo period; as well as Utagawa Hiroshige; Ichiyusai Kuniyoshi and Ito Shinsui. Albeit a modest gallery space, the show was expertly curated, with many works varying from the most modern to as far back as the 17th century. The contrast between the new and the old is quite refreshing. One goes from the Edo period all the way to the now, in a matter of steps. The techniques and principles, regardless of the year the print was made, still stays relevant and true to the ukiyo-e form dated centuries ago. Of course, the works of the acclaimed master Hokusai are breathtaking and demanding, however, a more recent artist, Shinsui, offers the most breathtaking to my eye. 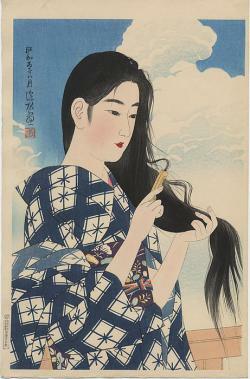 The vibrant colors and intricate textiles are aesthetically pleasing and the form of the subjects very striking, especially the works of Shinsui, my favorite from this exhibition being Woman Combing Her Hair, 1936, which is part of his Collection of Modern Beauties – 1929-1931. JapanCulture•NYC interviewed David Libertson, President of The Ronin Gallery, after the opening reception of 40 for 40 and we talked about how the gallery is run, future exhibits and the growing Japanese art scene in New York. JapanCulture•NYC: Can you give an idea of the daily duties managing the largest collection of Japanese prints in the U.S.? David Libertson: Running a gallery is actually remarkably similar to running any other small business: My days revolve around the usual marketing, finances and sales. Yet, the critical difference is that I also have the joy of curating exhibitions, producing scholarly catalogues, working with museums, and communicating with our represented artists. JapanCulture•NYC: I see that you have recently traveled this past July to Japan. These being annual trips to Japan and other countries, is it used to acquire new pieces to add to the gallery’s collection? What else? David Libertson: I am always on the hunt for new pieces. Since Japanese prints have been collected for centuries, these traditional works have been spread around the world. Though some assume that all the great pieces come out of Japan, today Japan is less of a seller and more of a buyer. My trips are excellent opportunities to both sell and acquire works in this lively marketplace. Of equal importance, my visits allow me to connect with collectors, artists, and museums, organize exhibitions, and look for new talent. I try to have a little fun too, or at least great sushi. JapanCulture•NYC: What are your thoughts on the Japanese art scene in New York right now? Is it competitive? Do you think these traditional Japanese art forms have gained popularity in recent years? David Libertson: It’s a small community, so naturally it’s competitive, but we’re all friends. Only through working together can we grow the art scene that we are all so passionate about, so anyone who does differently is doing the field a disservice. At Ronin, our main focus is to help grow the community and develop collectors. In the 1970s through 1990s, there was a boom of interest and excitement for Japanese art and culture; today we’re working hard to bring new relevance to traditional works by juxtaposing traditional and contemporary. JapanCulture•NYC: Lastly, what are Ronin Gallery’s plans for future exhibits, and are there any new and upcoming Japanese artists in this craft whom you are excited to showcase or would like to showcase? David Libertson: Don’t miss our anniversary exhibition 40 for 40: Celebrating 40 Years, exploring the development of Japanese woodblock prints from the dawn of ukiyo-e to today’s innovators. In conjunction with Asia Contemporary Art Week this October, Ronin Gallery is thrilled to welcome back Cyoko Tamai after her sold-out exhibition last year. Against Gravity presents 30 of her newest works, combining unique techniques, a musical sensibility, and traditional Japanese materials. As the holiday season rolls around, look forward to Great Art, Small Sizes: Early Works by HOKUSAI, presenting the rare early works of a true master artist. JapanCulture•NYC: Bonus question: Could you share any information artist Sebastian Masuda gave regarding his newly opened Monster Cafe (which I plan to visit when I travel to Japan next week) and the new piece he is working on for next year’s Asia Contempary Art Week? David Libertson: We’re so excited to welcome Sebastian to the Ronin Gallery family! I don’t want to say too much about it quite yet, but we will be bringing Kawaii culture in to the heart of New York City through installation, works for purchase, and events. I thank David Liberston for taking the time to speak with me and urge you all to visit The Ronin Gallery to show your support for the Japanese arts and to join in the celebration of their 40th anniversary. And be sure to not miss their upcoming shows of this year.